I DNF’d this at about 50% percent. I have to admit that this novel did spark my curiosity at first. The setting has a definite creep factor and it fits squarely in the sci-fi genre, two things that I like. 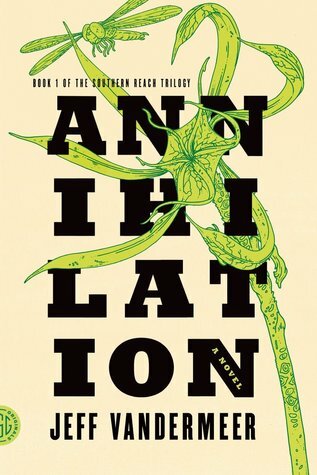 As far as the story itself, “Annihilation” is about four women explorers–a biologist, a psychologist, a surveyor, and an anthropologist–commissioned by a presumed government agency known as the “Southern Reach.” The team is the 12th expedition to the area, all other efforts to explore the region have failed and ended in the deaths of the explorers. The names for the women are never given, they are only there to work together, explore Area X, and report back to the agency with their findings. The story, however, is told by the biologist, who writes her findings in a journal. Immediately upon entering Area X you know that things are not what they appear to be. The land is uninhabited, though there is evidence that humans lived there. Upon entering, the team discovers a tower (or is it a tunnel?) that is not on the map, with strange plant-like spores and cryptic writing inside. The mystery of the tower (tunnel?) is obviously the crux of the book (there are pages and pages of descriptions about it, veering dangerously into Big Dumb Object territory) but it all got so boring that it just wasn’t enough to sustain my interest in continuing. For the first 10%, I was willing to suspend my disbelief long enough to give this a chance but by the middle, it no longer seemed worth it. The characters have no real personality and are so frustratingly neutral that I was disengaged from about the 10% mark onward. For my time invested, I felt like all of the weirdness went nowhere. Hence, I stopped reading. I probably will see the movie for this one, which is due in theaters in a few days. Though I am in the the “I Didn’t Get It” crowd, I’m still, in some ways, curious about the Area X mystery. I probably won’t read the rest of this series though to find out. I do want to know what it is, I’m not that damn curious. Not by a long-shot.